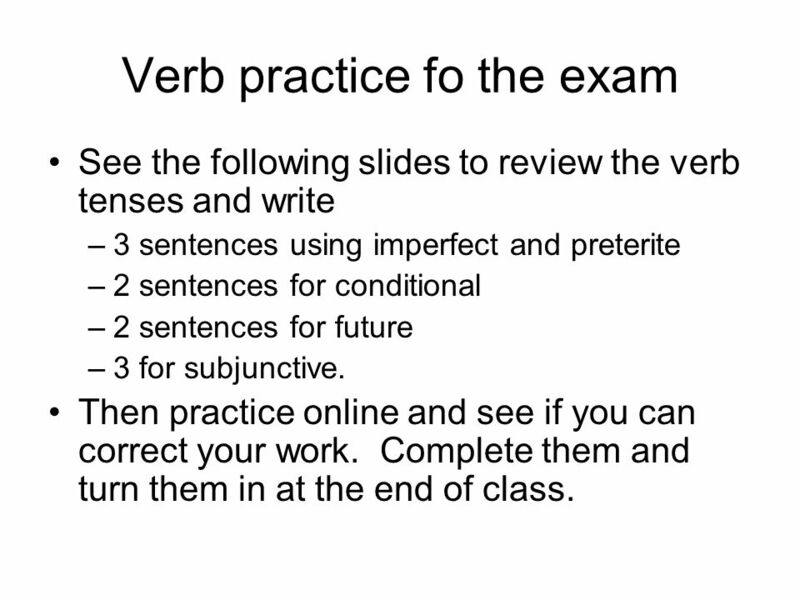 See the following slides to review the verb tenses and write 3 sentences using imperfect and preterite 2 sentences for conditional 2 sentences for future 3 for subjunctive. Then practice online and see if you can correct your work. Complete them and turn them in at the end of class. 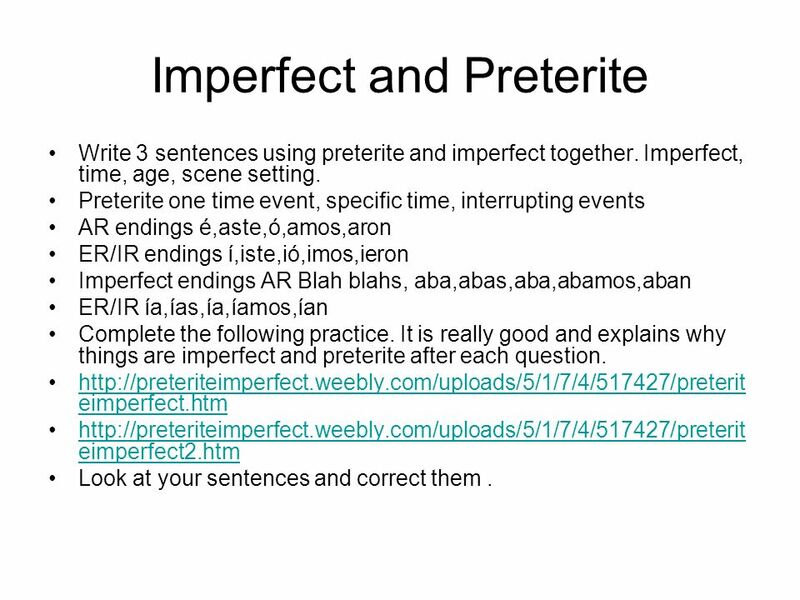 Write 3 sentences using preterite and imperfect together. Imperfect, time, age, scene setting. Preterite one time event, specific time, interrupting events AR endings é,aste,ó,amos,aron ER/IR endings í,iste,ió,imos,ieron Imperfect endings AR Blah blahs, aba,abas,aba,abamos,aban ER/IR ía,ías,ía,íamos,ían Complete the following practice. It is really good and explains why things are imperfect and preterite after each question. Look at your sentences and correct them . Future tense=will Infinitive (ar,er,ir) + endings é,ás,á,emos,án Hablaré, escribirás, irá, escucharemos, vivirán Conditional tense=would Infinitive (ar,er,ir) + endings ía,ías,ía,íamos,ían Hablaría, escribirías, iría, escucharíamos, vivirían Irregular stems for both future and conditional. Caber yo cabré	pone yo pondré	decir yo diré	haber yo habré Salir yo saldré	hacer yo haré	poder yo podré	tener yo tendré Querer yo querré	valer yo valdré	saber yo sabré	venir yo vendré Write 2 sentences for future and 2 sentences for conditional. 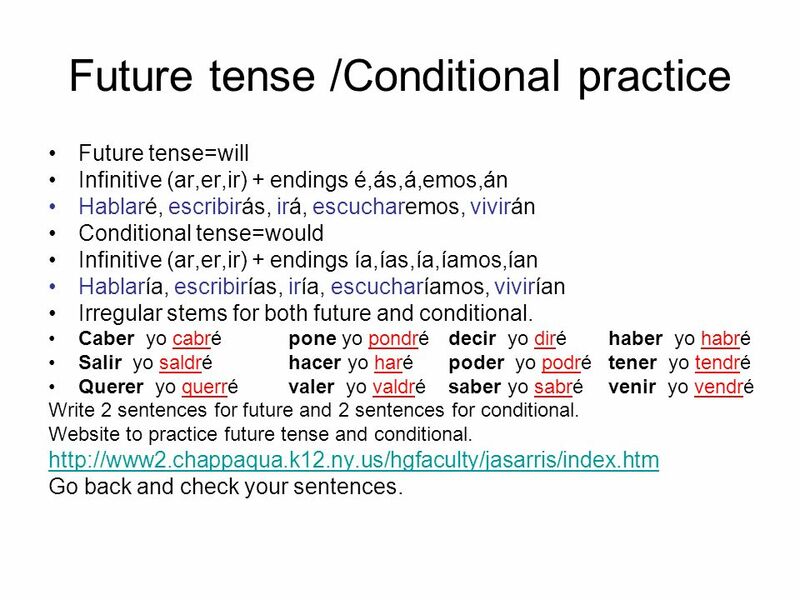 Website to practice future tense and conditional. Go back and check your sentences. AR endings e,es,e,emos,en ER/IR endings a,as,a,amos,an Wierdo phrase+QUE+ Subjunctive verb It is important that you call her. Es importante QUE tu la llames. I doubt he will fight. Dudo QUE el pelee (pelear = el pelee) We recommend that you come to an agreement. Recomendamos QUE tú llegues a un acuerdo. Write 3 sentences using subjunctive. 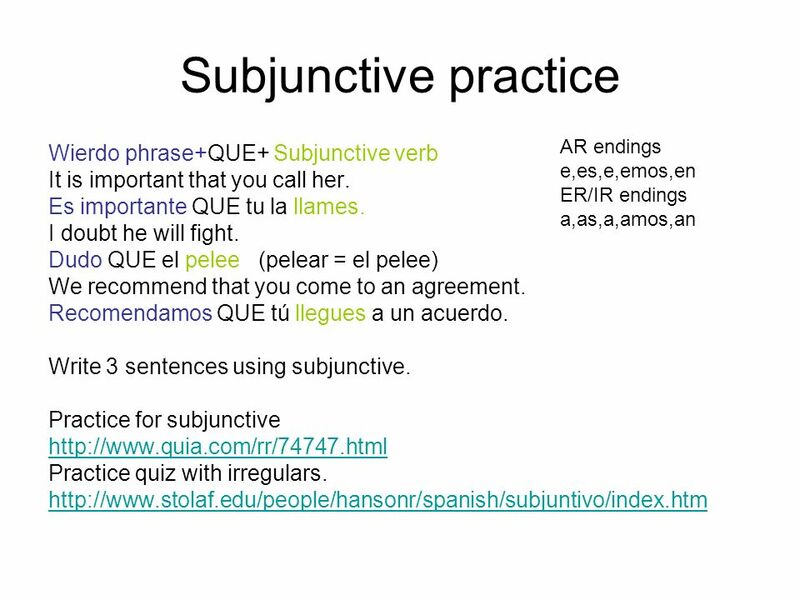 Practice for subjunctive Practice quiz with irregulars. Download ppt "Verb practice fo the exam"
El Pretérito “Simple” past tense – for things that have already happened He ran, he did run. Conjugating el pretérito for regular verbs: Start with infinitive. Review of the Conditional Forms To form the conditional, add the conditional endings to an infinitive. Conditional endings are the same as those of the. The Future Tenses in MFL Spanish © CAS 2002. In English we say I hope that… to express hopes or wishes. Verbs that follow such expressions of hope dont require a special verb form. However, in Spanish. Conjugating Verbs in the Preterite Tense. Steps to conjugate in the Preterite 1.Find the stem by dropping the last two letters off of the infinitive. El Imperfecto What is it and when do you use it?. El Imperfecto (Imperfect) The Other Past Tense. Los objectivos Understand how to conjugate regular verbs into the imperfect tense Understand how to conjugate.